1. Pants. The best 5-pocket corduroy pants we've ever worn are Uniqlo's Slim Fit Corduroy Jeans. Indeed, you have to be slim and fit to wear these, but as the product description says, they do in fact "create slender, fashionable lines," work during the week, and have the versatility to play on Sundays. We're wearing them in off white. A tremendous value at just $39.90. They're vanity sized about 1 inch in the waist (so size down). 2. Belt. A critical element of our understated fandom gameplan is our own Game Day Belt. Made from the same Horween leather that's used to make the official NFL footballs, and constructed right here in the Twin Cities. Fits perfectly true to size. 4. Shoes. Sneakers and exposed ankles are usually the play call for mid-October Packer games, but given the forecast we're audibling into ankle boots. Since our all-time favorite TST chukkas have seemingly gone the way of Peyton Manning's arm strength, we're substituting them for these Joyks with beautiful thick white rubber whitewalls. (We may additionally substitute free-agent white laces.) Fits fractionally small. 5. Vest. We have a thing — bordering on fetish — for goose-down puffer vests. 313, Montecore, and Marville provide the best value, but if you have the cash Duvetica is the way to go. This version — along with a Hall of Fame headbuzz — will stiff-arm the dramatic post-game cool-down, and the blue-and-gold color combo is a subtle, tasteful nod to the Packer throwback jerseys (which the team will be wearing on Sunday). We always size down one for puffer vests, and this is no exception. Q: I'm starting a new school year on Tuesday and want to know: what does an MB teacher wear? A: As is often the case, movies hold the answer. You want to set yourself apart from the Phys. Ed. teacher, but not go too dressy in the direction of Mr. Hand or Ben Stein's famed economics teacher; it's a slippery slope towards administration, or Looking Like Principal Richard Vernon. 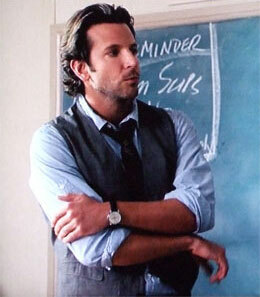 While this was the least believable movie role since Denise Richards played a nuclear physicist in The World is Not Enough, Bradley Cooper's artfully disheveled prep-school teacher in The Hangover strikes a fine balance: vest (one size smaller than normal), sleeve-rolled chambray work shirt, undone repp tie, accessorized with a vintage watch in a black nylon band. Q: I have a matching gray vest and suit jacket that was once part of a three piece (the pants ripped). Is it MB to wear the top two pieces with pants of a different color? Perhaps black pants? Please advise. A: No, don't do that. In fact, don't even hang the jacket and vest near each other in your closet. Their relationship is over. We're not huge fans of this look, but you can salvage the vest by pairing it with denim and a white shirt. The jacket, on the other hand, is probably a lost cause. Since it was once part of a 3-piece suit, it's almost certainly not going to have a cut that works with denim. And combining with dress slacks is a look that should be left to middle-aged men attending Sunday service. Feel good about yourself and donate that jacket to the nearest Salvation Army -- it will help some recently laid off Christian maintain his churchly style even in the midst of financial hardship. Q: What is your feeling about vests? I have a green herringbone piece I picked up at a thrift store. It seemed to go over real well with the ladies at happy hour last Friday. It was accompanied by a shirt and tie of course. A: This is part of the well-known Justin Timberlake Effect. Based on the chicks' reactions, it sounds like you executed this look successfully, which ain't easy given the fairly high degree of difficulty (not to mention the green herringbone). Savvy MBs should proceed with caution; others are probably better off leaving it to the King of Pop. Even without 15 pieces of flair it's easy to veer towards Stan, the manager at Chotchkie's.